View full range of Personalised Corporate Umbrellas here. 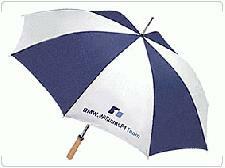 Have your business details printed onto a corporate umbrella. It really is a great promotional giveaway. It might be raining, but your customers aren't getting wet! So have your business details a head above the rest and advertise your company details on our Corporate Umbrella today! Lots more news and offers and other items to the corporate umbrellas click here. A personalised umbrella that helps your name stick in the mind of apotential customers is worthwhile and you can see a wide range of umbrellas on the Company Promotions umbrella website. An Umbrella is a perfect corporate gift. There are many umbrella companies and lots of umbrella models. It can be difficult and time consuming to find corporate umbrellas which suits your exhibition and more importantly, that suits your budget. 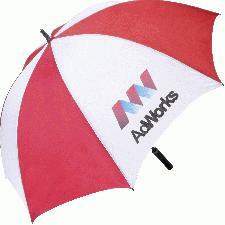 Company Corporate Promotions can be great and promotional umbrellas are a useful piece of brand awareness. Variety of handles, decals, material closures and spikes. To find out more about our Corporate Umbrella click here and fill in the contact form and we'll get straight back to you.